While markets are speculating about Federal Reserve appointments and handicapping tax reform, the earnings season kicks into high gear. The earnings season kicks into high gear this week as markets remain focused on happenings in Washington. Roughly 40% of S&P 500 companies are set to report third quarter earnings this week and expectations are high. Strong economic performance, despite hurricane impacts, underlie optimistic analyst forecasts for corporate earnings. For the full year, 2017 S&P 500 operating earnings are expected to increase 9% from 2016, and high growth is reflected in above average valuations. The S&P 500 trades at 17.9 times expected earnings, compared with a 10-year average of 14.1 times according to FactSet Research. Record stock prices and strong earnings growth are supported by a better economic performance. The third quarter GDP report, due out this Thursday, is expected to show continued above-trend growth. Economists surveyed by Bloomberg expect 2.6% growth, and the Atlanta Fed’s “GDP Now” forecast calls for 2.7% annualized growth. 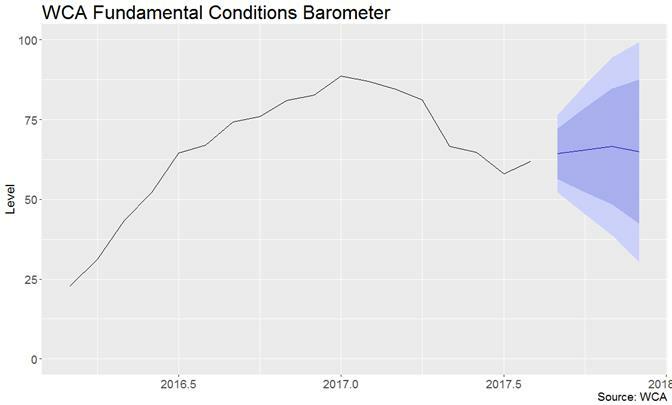 Our own WCA Fundamental Conditions Barometer, which broadly measures changes in market and economic conditions, appears to be firming slightly as we start the fourth quarter (chart, below). Sustained market confidence, continued growth, and better earnings pushed our forecast path higher for our barometer. We now see the barometer remaining near 65 between now and year-end. The dark line through the blue shaded forecast horizon measures our “base case” forecast. This forecast lies at the middle of a broader range of less likely forecasted outcomes (shaded area). Importantly, the base case view is better than last month’s forecast, suggesting an improvement in the near-term view for economically sensitive assets.